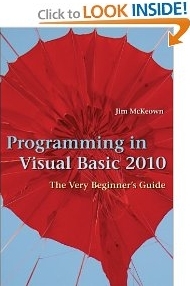 This book is an introduction to programming using Microsoft's Visual Basic.NET 2010. It is intended for novice programmers with little or no programming experience or no experience with Visual Basic. The text emphasizes programming logic and good programming techniques with generous explanations of programming concepts written from a non-technical point of view. This book is an introduction to programming using Microsoft's Visual Basic.NET 2010. It is intended for novice programmers with little or no programming experience or no experience with Visual Basic. The text emphasizes programming logic and good programming techniques with generous explanations of programming concepts written from a non-technical point of view. It stresses input, processing, and output and sequence, selection, and repetition in code development. File I/O and arrays are included. Later chapters introduce objects, event programming, and databases. By taking a slow and steady approach to programming ideas, this book builds new concepts from what the reader has already learned. VB tips and quips inject both humor and insight. The book includes numerous programming examples and exercises, case studies, tutorials, and "fixing a program" sections for an in-depth look at programming problems and tools. Quizzes and review questions throughout each chapter get students to think about the materials and how to use them. Each chapter has a summary and glossary for extra review. Steven D Erickson of Temple Hills, MD says, "Jim McKeown's Programming in Visual Basic 2010 is both an excellent guide to programming in Basic and a tutorial on the use of the Visual Basic 2010 application. I had my worries that the subtitle "The Very Beginner's Guide" assumed I was a stupid person or would only introduce the most basic material. But this only means that nothing is taken for granted. Being a person with experience programming in multiple languages and systems, but no formal training and no understanding of modern computing concepts (like "objects" and "controls" etc. ), this provided solid and thorough guidance that rounded out my understanding of the basics, and gave an excellent presentation of the aspects that were new to me. His writing style is easy-going and humorous, but still clear and concise. The materials in each chapter include a good conceptual introduction, followed by a specific line-by-line walk through code, many example programs that handle specific practical scenarios, a section on problems you can expect and exercise in debugging problems, occasional quizzes, concept review and Summary, a glossary of terms, and a test at the end (with answers in the back of the book). To truthfully disclose all of my observations, I am obliged to point out a couple of things. Mr. McKeown recommends a programming style that seems to me to be almost fanatically concerned with organization. He likes all his variables to be named with a three-letter code in lower case that tells the variable type. He likes all input to be complete before doing any processing, and all processing done before any output (and he almost apologizes when one example goes out of that order). He loves Flowcharts. I will certainly agree that disorganized code can breed errors, but I don't believe that you have to be insane about it! Well, I wouldn't say the man is insane, he just likes his way, and he would really like it if you followed his way. Some reviews might mention as a criticism that this book is not comprehensive or encyclopedic, but who likes reading an encyclopedia? (It has as many pages as some "encyclopedic" books about programming in Basic) I got enough understanding from this book that I could now actually use and comprehend some of the more comprehensive resources there are (like the VB2010 "Help" file -- what a name!). I doubt I can now claim to have the skills and understanding of a professional programmer. But I do now possess the knowledge to develop useful applications in Basic. I'm a functional programmer after just a few days with this book! I like that!"